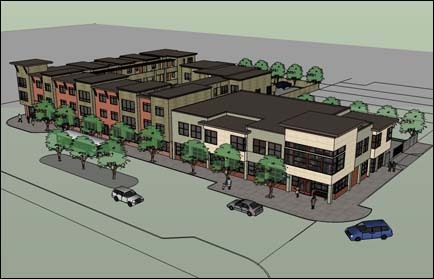 Stretching one city block, the Lillie Mae Jones Plaza will provide the residents of Richmond, CA with both affordable residential units and a health center. The Brookside Community Health Center is 9,500 square feet and includes nine exam rooms, health education offices, medical storage and facilities to serve doctors and staff, as well as a communal meeting room. 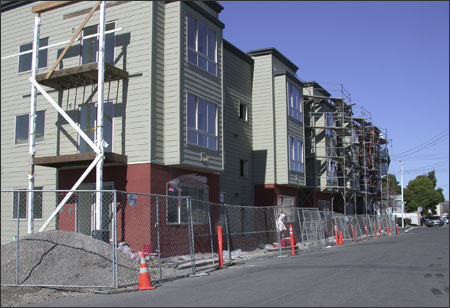 Twenty-six residential units comprise the Community Housing Development Corporation (CHDC), the affordable housing component of Lillie Mae Jones Plaza. A central landscaped courtyard with play areas for children provides outdoor spaces away from the busy street. Green elements are to be incorporated into the building, including the use of environmentally-sound materials and passive solar heating and cooling. Parking spaces for 47 cars are provided for the two buildings. Completion is scheduled for May 2011.